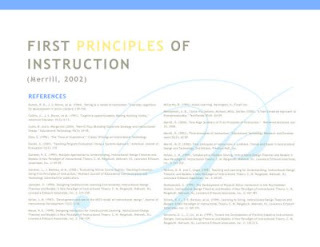 I have been researching effective teaching strategies and have settled on Merrill's First Principles of Instruction as an incredibly important contribution to the field of instructional design. I believe that Merrill has identified the most fundamental, effective methods for providing effective instruction in any setting. 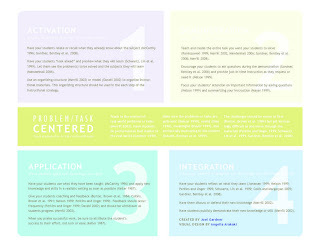 I have just been working on a new project and am really working to implement the first principles. Any chance you have this in a more readable format. Maybe a PDF? I want to post it on my wall as a quick reference and a reminder. This is the only version I have of this handout, Bruce - I apologize! I will see if I can find anything else that might be useful to you.